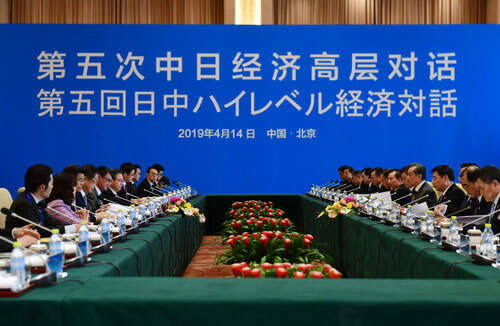 On April 14, 2019, State Councilor and Foreign Minister Wang Yi and Foreign Minister Taro Kono of Japan co-chaired the 5th China-Japan High-level Economic Dialogue in Beijing. 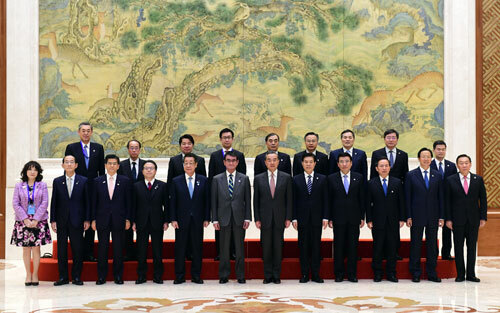 Wang Yi expressed that China-Japan relations have returned to the right track and achieved new progress under the joint efforts of the two countries' leaders and people of all social circles. China-Japan High-level Economic Dialogue, which was restarted after an eight-year hiatus last April, effectively facilitated policy communication and practical cooperation. At present, economic cooperation between the two countries has enjoyed constantly deepened space, rapidly extended areas, width and depth, and increasingly enhanced vitality and resilience, while being advanced at bilateral as well as multilateral levels. Wang Yi pointed out that China and Japan are important close neighbors. As major economies in the world, the two countries shoulder significant responsibilities in building an open world economy and maintaining regional stability and development. This year marks the 70th anniversary of the founding of the People's Republic of China, while Japan will enter the "Reiwa" era. Relations between the two countries are standing at a new historical starting point and facing the historic opportunity for development at a higher level. The two countries should continue taking the important consensus reached by the two countries' leaders as guidance and grasp the favorable opportunity that China is implementing high-level opening up and pursuing high-quality development while Japan is pursuing sustainable economic growth to jointly construct bilateral economic relations to meet the needs of the new era. The two countries should make steady headway in promoting bilateral investment and trade cooperation, jointly build the Belt and Road Initiative, actively explore third-party market cooperation, vigorously facilitate local cooperation, and explore as well as make innovation in new ways of cooperation. Wang Yi also called for consolidating the cooperation results in six major areas, namely energy conservation and environment protection, science and technology innovation, high-end manufacturing, finance, sharing economy, medical care and elderly care industries. China and Japan should make joint efforts to promote trade and investment liberalization and facilitation, forge a business environment of fairness, justice and non-discrimination, and speed up negotiations on the Regional Comprehensive Economic Partnership and China-Japan-Republic of Korea free trade agreement to guide the process of economic integration in East Asia. The two sides should strengthen communication and coordination centering on such issues as the G20 Osaka Summit and reform of the World Trade Organization, uphold multilateralism and free trade, and promote the reform of the global economic governance system to develop in a right direction. Taro Kono said that since Japan-China relations returned to the right track last year, bilateral cooperation in various fields has been expanded and deepened, and the tone of bilateral relations has shifted from competition to coordination. Both Japan and China are important economies in the world. To strengthen communication and cooperation is not only in the interests of both sides, but also of great significance to regional stability and prosperity and world economic growth. Economic cooperation has always been the foundation and driving force of Japan-China relations. Facing a global situation of intense uncertainty, the two sides should jointly safeguard the multilateral trading regime based on rules and take the G20 Osaka Summit to be held in Japan as an opportunity to strengthen communication and coordination on improving global economic governance. During the Dialogue, foreign affairs and economic departments of both countries exchanged comprehensive and in-depth views and achieved a series of consensuses on macroeconomic policies, bilateral economic cooperation and exchanges, important cooperation under the Dialogue, regional economic integration, and global economic governance.